Newer: » Merry Christmas from The San Pedro Sun! Founder of the San Pedro Cancer Society (SPCS) Monica Prevett is happy to report a successful 2012, with two success stories during the group’s efforts. Monica extends her gratitude to the San Pedro community for supporting the society during fundraisers and special events. The San Pedro Cancer Society is the youngest and most active cancer group in the country. In the coming year SPCS seeks to educate people on taking treatment in the country at the Dangriga Cancer Center rather than abroad. Not only is it easier to communicate, but treatment available locally is less costly as opposed to abroad. When patients choose to go abroad, they have to take into account the cost of travel, the expense of the hospitals in the countries they get treated in, and the cost to stay as well. As an added bonus, the Dangriga Cancer Center gives free second opinions on a patient’s health status. The SPCS encourages people to consider taking the opportunity given by the center. The Dangriga Cancer Center has recently made available a pediatric wing so that children don’t have to go abroad for treatment as well. This is definitely an added bonus, for parents who are tasked with seeking help for their children, and cannot afford to travel. With all these opportunities available at home, SPCS asks residents of San Pedro to seek aid and not be silent, and explore their local medical options. Monica would also like to thank Castillo’s Hardware for a great ($500) donation towards the Society’s coming events for World Cancer Awareness Day. Plans to observe this day include a banquet on February 2, 2013, an all-day health fair on February 3rd 2013 and the main event: the annual lighted candle walk on February 4, 2013. 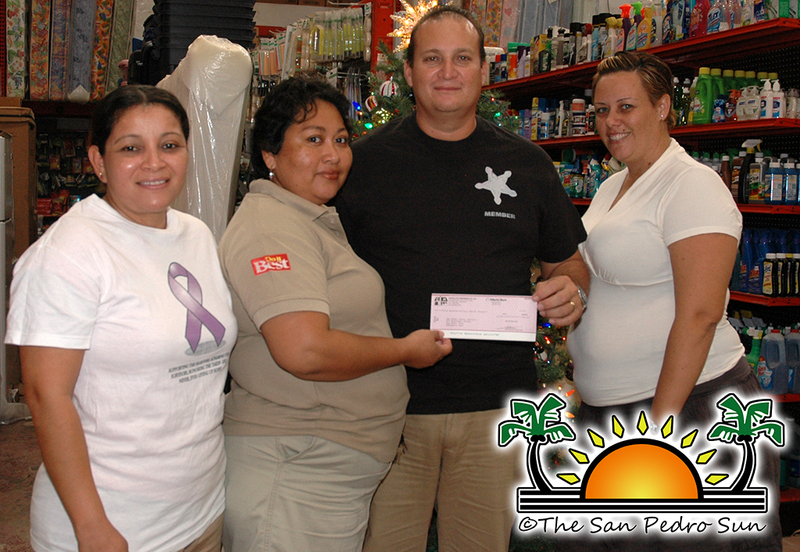 Island businesses are asked to kindly consider the San Pedro Cancer Society when making donations, both monetary and in kind (especially gifts/prizes). The general public is also encouraged to participate in the upcoming fundraisers and events, as it is with your help that funds, 100% of which goes towards treatment and aid to cancer patients, can be raised. The SPCS currently has a roster of fifteen members but if any person is interested in joining the group, registration will take place on January 7, 2013 at a general meeting that will be held at Bistro Mestizo at 6PM. Further information can be obtained by contacting the SPCS via email to: [email protected] or you can contact Monica Prevett directly at telephone number 665-0611.